"The controversial author of The Nurture Assumption (1998) -- in which it was argued that peer relations, not nature or nurture, were the driving force in child development -- continues her exploration of what makes us the way we are. 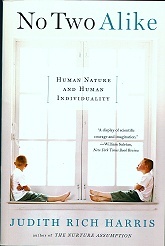 This time Harris offers a "scientific detective story" aimed at uncovering the secret of human individuality. Armed with new psychological theories and cutting-edge, high-tech tools, Harris takes a multidisciplinary approach to answering the nagging question of why identical twins raised in the same household often differ, sometimes dramatically, in personality? Harris delivers an answer (and, yes, it's sure to be controversial), but it's the quest itself that will prove most fascinating for general readers, who will marvel at the step-by-step accumulation of facts, as the author marshals her argument by adeptly juggling a wide array of tools, from new theories of evolutionary psychology to behavioral genetics and linguistics." --David Pitt, in Booklist, 1/1/06. 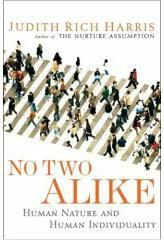 "As she did in The Nurture Assumption (1998), independent scholar Harris makes waves again with a new theory of personality to explain why no two people are alike. Based on behavioral genetics and evolutionary and social psychology, and fitted into a modular theory of how the brain works, . . . she posits three distinct systems as the molders of personality. One is a relationship system that allows babies to distinguish family from strangers and throughout life allows us to build a "mental rolodex" of information on discrete individuals. The second is a socialization system. Sure, parents count, she says, but what turns us into social beings is what happens in school and at play, as we become members of a group . . . Third is a status system by which we acquire self-knowledge by measuring how we stand up against rivals . . . These dynamics play out against a hefty genetic contribution that makes individuals more or less aggressive, shy, anxious, attractive and so on. There's a lot to be said in favor of these systems (and genes), and Harris lays out telling points in their defense -- while also laying out some of the leading lights of personality psychology for their sins of omission and commission." -- Kirkus Reviews, 12/15/05. "With neither a doctorate nor a university behind her, Harris more than compensates with intelligence, dogged research, lively writing, a love of mystery, and droll humor. She wrestles bulging files of research data into shape, in the process taking down some champions of the old order, including Freud . . . . Harris makes behavioral genetics and evolutionary psychology enjoyable and accessible to general readers as well as scholars. Essential for general and academic libraries." --E. James Lieberman, M.D., in Library Journal.